It's easy to forget that Ryan Kalish is just 29 years old. It's easy to forget that, prior to injury after injury after injury that's derailed his career time after time, Kalish was once one of the biggest prospects in all of baseball. It is, perhaps, easy to forget that even after over a half-dozen operations, he still got back to the big leagues in less than month with the Chicago Cubs in 2016. Perhaps you've forgotten about Ryan Kalish all together, since he hasn't played on American soil in 21 months. But do not forget, not for a second, where Kalish grew up. Born in the Northridge neighborhood of Los Angeles, Kalish made a name for himself at Red Bank Catholic High School. Ryan Kalish grew up in New Jersey. Set to make another memorable comeback attempt, there isn't any surgery that can take that out of him. "The thing about Jersey is I feel like it's a very hard-nosed area, especially sports-wise," he told MyCentralJersey.com in a lengthy phone conversation. "People are very tough in the area, so you know you're getting the best out of pretty much everyone. Obviously, the density in population, in my opinion, increases the level of competition by a ton. If you don't work in New Jersey, you're not going to rise. You see more and more people coming out of Jersey. If you're not willing to work, you're going to be in trouble, and I really am thankful for that. Everybody works hard at these levels, but I just feel like that simple east coast 'I'm here to work" mentality is a really big part of being good at baseball." Kalish won't be authoring his latest comeback story in New Jersey -- he's instead signed a deal with the Atlantic League's New Britain Bees, the Liberty Division rival of the Somerset Patriots, who also expressed interest -- but is headed back home for six weeks after completing workouts in California. "At the moment, I'm in LA, but I'm heading up to Northern California for a little bit to hit with my best buddy Lars Anderson and another guy named Gary Malec; they started a baseball bat company together called Birdman Bats," Kalish said. "It's like a big family of baseball guys, and we're going to get out there every day and hit and run around. For the six weeks leading up to right before the season, I'm actually going to end up in New Jersey, which is where I grew up. I'm going to head back there and get ready for the season, I think it makes sense to get sort of nested on the east coast for a while before the season starts. I'll be in Red Bank. I'll probably live in Sea Bright, because that just seems like where the best rentals are right now for me, but it's all very familiar territory." Having made a name for himself not far from there, Kalish was taken in the ninth round of the MLB Draft by the Boston Red Sox in 2006 and made his big league debut in July of 2010. It was to be the beginning of his time as one of the cornerstones of the franchise. Instead, it was the start of a rocky path that saw him sidelined with no fewer than eight surgeries prior to his latest stint in The Show with the Cubs just two years ago. "At this point, I'm not frustrated anymore," said Kalish of losing time to injuries. "I was frustrated, especially during the first three or four years of (missing) time. But eventually, you just have to kind of make peace with what's happened. For me, I don't know, maybe I wouldn't have been a solid human being if everything had went smoothly. I'm not looking back, I don't feel those feelings anymore. That's the old me." Of course, those injuries have taken their toll. The laid-back outfielder would be lying if he said retirement hadn't crossed his mind, especially after having to undergo further knee operations in 2016 one year after missing the entire season recovering from a microfracture procedure. "I said at that moment, I think that was the first time after those two surgeries where I said if I get hurt again, I'm probably done," he said. "With what happened in 2016, even with the small amount of time I played, I made it back to the big leagues after less than a month in Triple-A. Once that happened and I got that taste again of making it to the highest level, I was like, 'I can't quit, that's ridiculous.' It would be one thing if I was terrible. The work is still going in...it's not like I'm just going to show up and hit, because it's not that easy. It doesn't matter what level you're at, hitting a live pitcher is something you can't replicate. Getting back out there and seeing more of that is exactly what I need." And the Atlantic League is where Kalish will do just that. He felt a connection with new Bees manager Wally Backman, and enjoyed the familiarity that playing in that region gave him. "Wally was interested, and we had such an amazing chat," Kalish said. "I've always heard such good things from a lot of people about him, so I was really excited about that. New Britain's so close to Boston and Pawtucket and everything, and I've spent so much time out there and played at that stadium in Double-A, so I'm real excited." 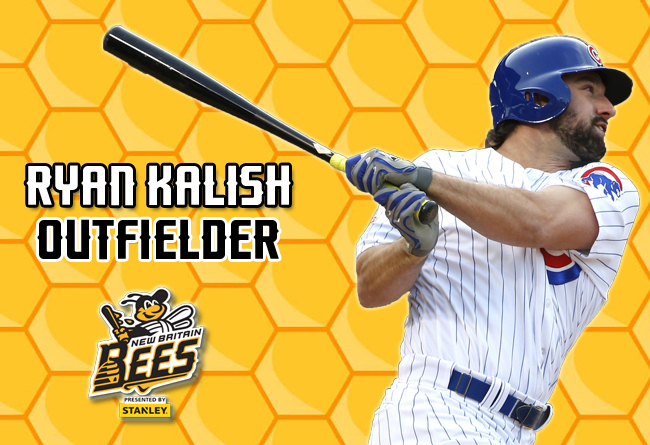 Kalish, who had actually signed with the American Association's Sioux City Explorers in 2016 but never actually played a game for them before accepting an offer from the Cubs, joked that the more he plays baseball, the more he knows that he doesn't know anything. But he is familiar with independent baseball, acknowledging that "guys in this league are fighting to keep their careers alive." The six foot, 215-pounder will start the fight in as good of physical condition as can be expected, having already tested the waters with short stints overseas this winter. "That's the best part about it, I feel really good," he said. "There was an adjustment period, and there always is. I've had so many surgeries at this point, that I kind of know that I'm going to feel some stuff when I first get back into it. As it keeps going and going and everything mends, I start feeling better and better. That's what I feel like happened through Australia and Puerto Rico for me. Obviously, I would have loved to have played better for those two teams, but I had 20 months off from seeing live pitching before that moment. Before that, I'd played for five months and missed 15 months before that. You're looking at a long period of time off from live pitching, so I'm excited to continue that fight up in New Britain." For many players who've been through what he has, a commitment to only a few weeks of playing in the Atlantic League would hardly be unprecedented. But it's clear that even though he's left New Jersey, New Jersey hasn't left Ryan Kalish. He's not giving up that easily, not just yet. "I think it's a mix. I honestly think a year playing indy ball and maybe another round of winter ball, but at that point, if I'm not seeing the type of progression that I want to be seeing, I think I would feel totally cool walking away from the game," he said. "But that's just my overall thought. Plans change. I'm not really sure exactly what will happen. But in a year from now, I'm going to have a really good idea of where things are headed. I have a lot of things I want to do in my life after the game, but I feel personally after 70 at-bats (overseas) and not really playing that well after such a long time off...sometimes I feel like I want to walk away, but I don't want to lay my head down in two years and say, 'I just did all that for 70 at-bats and just walked away?' That would be stupid. There's a lot of mix there, and there's really no telling what will happen."